Dale Earnhardt Jr. will, once again, come out of retirement for a NASCAR Xfinity Series race in 2019. He announced via Twitter that he’ll run the Xfinity Series race at Darlington (S.C.) Raceway on Aug. 31. “Come to @TooToughToTame this year. I’m running the @XfinityRacing race,” Earnhardt (@DaleJr) tweeted. The tweet was buried in comments to a Joe Gibbs Racing tweet revealing one of Martin Truex Jr.’s paint schemes for the upcoming season. Earnhardt was responding to another fan’s comment. Earnhardt retired from full-time competition as a NASCAR driver at the end of the 2017 season. He has competed in a Monster Energy NASCAR Cup Series since then, but he came out of retirement to run the fall Xfinity Series race at Richmond (Va.) Raceway last season. He led a race-high 96 laps and finished fourth. That is the only NASCAR national-level race in which he has competed since his retirement. 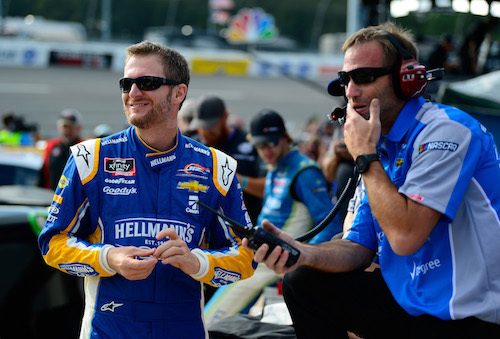 Earnhardt remains a team owner in the Xfinity Series and is a broadcaster for NBC’s NASCAR coverage. He told NBC Sports that he wanted to run the Darlington race because of the track’s “throwback” theme. He also hinted that he has a cool retro paint scheme in mind for the race. Earnhardt is a two-time champion of the Xfinity (then-Busch) Series, winning back-to-back titles in 1998 and 1999, his only two full-time seasons in the series. He continued to compete part-time in the series after moving to the Cup Series.